If you suffer from uveitis, it is important that you undergo the various uveitis investigation and tests. These are tests that your ophthalmologist will recommend that you undergo in order to look for any uveitis-associated complications in the eye and also to determine the cause of the uveitis. They will include blood tests, scans of the eyes and X-rays. Uveitis is an inflammatory disease affecting the uveal tract in the eye. The uveal tract comprises the iris, ciliary body and choroid. Any disease that causes inflammation of any (or all) of the uveal tract is therefore considered a form of uveitis. 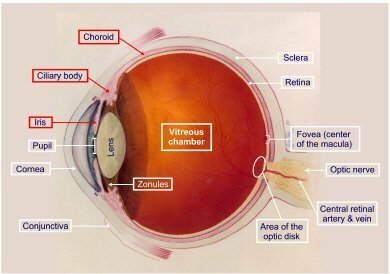 Diagram demonstrating the anatomy of the eye. The uveal tract, comprising the iris, ciliary body and choroid, is highlighted in red boxes. One of the reasons for performing these uveitis investigations is because inflammation of the uveal tract can cause various ocular complications. Some complications are easily detected through clinical examination, such as cataract and glaucoma. Other sight-threatening complications, such as macular edema and vasculitis, may be more subtle and may not be so easily seen clinically, thereby requiring scans. Another reason for performing uveitis investigations and tests is because uveitis can be associated with underlying diseases that affect the rest of the body. Examples of infectious diseases that can cause uveitis include tuberculosis and syphilis. As for non-infectious inflammatory diseases that can cause uveitis, these include sarcoidosis and ankylosing spondylitis. By performing these investigations, clues can be obtained as to whether there is any underlying disease that needs to be treated. Fluorescein angiography (FA): Fluorescein is a yellow dye that is injected into your bloodstream through one of the veins in your arm. Once injected, the yellow dye will travel throughout the body, including the eye. If there is any weak point in the blood vessels, the dye will leak out and is then photographed using a special camera. Fluorescein angiography is a very useful investigation technique to detect leakage from the blood vessels in the eye. It is very commonly used to diagnose cystoid macular edema (picture above) from uveitis, age-related macular degeneration and diabetic retinopathy. Fluorescein angiography can also be used to detect inflammation of the blood vessels (vasculitis) and areas of insufficient blood supply to the retina (retinal ischemia). Optical coherence tomography (OCT): OCT is a scan that enables high magnification and high resolution cross-section images of the retina to be taken. It is a non-contact and non-invasive scan, meaning that the scan does not involve touching the eyeball and does not involve any injections. 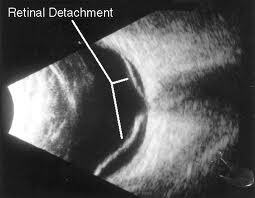 The newer spectral domain OCT scans are excellent in detecting subtle changes in the macula (central part of the retina), such as the cysts seen in macular edema (picture below). Cystoid macular edema causes loss of your central vision. As such having cystoid macular edema indicates sight-threatening uveitis, which means that you will require more aggressive treatment for your uveitis. B-scan ultrasound: For all cases of uveitis, it is important that the retina be examined thoroughly. Sometimes, your ophthalmologist may be unable to obtain a good enough view of your retina as a result of complications due to uveitis. These include posterior synechiae (where the pupil is constricted due to adhesions of the pupil to the lens), cataract and dense vitreous debris. In these situations, an ultrasound B-scan is helpful to determine the state of the retina. 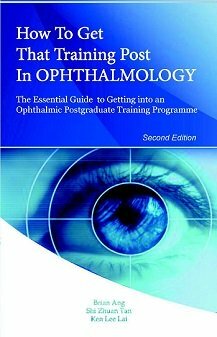 It is particularly useful to look for retinal detachment. B-scan ultrasound is a safe method of scanning the retina and orbit. Your eye will firstly be anesthetized with eye drops. A gel will be placed on the ultrasound probe, which then gently touches your eyeball. You will feel a cold sensation from the gel and slight pressure from the probe. You will be asked to move your eyes in different directions so that the entire eye can be scanned. A scan typically takes up to 15 minutes. Blood tests: Blood testing is an integral part of the uveitis investigation process. This is particularly so if you have bilateral uveitis (where the uveitis affects both your eyes) or recurrent uveitis. This is one of the ways to detect any underlying systemic disease that may be causing your uveitis. Blood tests are also useful as a way of monitoring the general state of your health, particularly if you are going to be started on oral steroid medication for your uveitis. - T-SPOT.TB & QuantiFERON-TB Gold. Additional blood tests may be required depending on certain circumstances. For instance, if you have been bitten by deer ticks or scratched by cats, you may need to undergo Lyme disease serology and Bartonella serology respectively. If there is sufficient clinical suspicion, you may sometimes also need to undergo HIV testing. Tests that indicate infection include an elevated white cell count, positive syphilis serology and positive T-SPOT.TB testing. Tests that indicate a systemic inflammatory disorder include an elevated ESR and CRP, positive ACE, positive autoantibodies at high titres and positive HLA antigen testing. While these blood uveitis investigations provide useful clues, the results should always be taken not in isolation but in conjunction with the entire clinical picture. X-rays: X-rays is a relatively simple and cheap way of allowing the bones and some organs inside the body to be visualized. In the context of uveitis, there are 2 x-ray tests that are probably the most useful. Chest X-rays allow the detection of lung lesions seen in sarcoidosis and tuberculosis. Also, if your chest x-ray finds an area of active lung infection from any cause, you may have to postpone your systemic steroid medication until your infection improves. Sacral X-rays are useful to detect the typical spinal features of ankylosing spondylitis. Chest X-rays allow the detection of lung lesions seen in sarcoidosis and tuberculosis. Also, if your chest x-ray finds an area of active lung infection from any cause, you may have to postpone your systemic steroid medication until your infection improves. Sacral X-rays are useful to detect the typical spinal features of ankylosing spondylitis. All these uveitis investigation techniques allow your ophthalmologist to provide targeted care for your uveitis. The investigations listed above are not an exhaustive list - there are many other tests and investigations which may become appropriate depending on the clinical scenario. Most cases of uveitis only affect the eye and do not have any underlying systemic disease. However, if you have an underlying systemic disease causing your uveitis, then your uveitis treatment strategy must also include therapy of the underlying disease.